YOUR PRESENT MOMENT... IS THE POINT OF POWER. What do we mean by mindfulness? Mindfulness is an awareness that is over and above just being awake. It is embraced by serenity and calm. The reason for that is because it has no past and no future. It is just this very moment that your heart is beating in, and your lungs are expanding in. Our lives are busy and sometimes complicated. We go too fast and too far in too little time. We allow stress to become our constant companion. Stress takes the joy out of our lives. It takes the health out of our bodies and scatters our thoughts in a million directions. Mindfulness, can bring us back to peace. It can bring back the joy of simple things in life. The simple things in life are the most important things in life. When our life is over, it will be the simple things that we will remember. Take a walk in the park. Stop all your mind chatter. Just let it go. Feel the ground beneath your feet. Really feel it! Where do your shoes touch your feet? Is the ground hard or soft? How does the fabric of your clothes caress you as you move, and where? Feel the breeze around you. What direction does it come from? See the water droplets on the leaves. Look up at the clouds in the sky. Listen to the birds singing. How many different songs can you hear? Where water is flowing, can you hear it rippling? Touch the moss on the tree trunk. The bark on the tree will tell you how old it is. Smell and taste the air. As you walk, look around you everywhere. Do you notice how the light bounces and reflects off nature? Can you hear trains in the distance? How many sounds can you hear? Are there fragrant flowers around you? This is being in the moment. Your moment! We let the past influence our present. Anything that has happened to us or any occurrence that has taken place, we put a meaning to it and a belief about it. A neuro pathway is created in our brain and that becomes our truth. We carry these truths around with us wherever we go. And they influence out present moment. So in actuality, we are basing all of our decisions on what we believe about things. That is what I call living in the past and perpetuating the events of the past. We often spend time thinking about past events making them still active and relevant. Most often, the beliefs that we created in our past are based on one incident or one aspect of our lives. They are often no longer useful to us. In fact, I believe that they are not at all. Things change, we change and other people change. Holding onto unworkable beliefs holds us back from making positive changes in our lives. This is not to invalidate what has happened to us, or what others have done to us. It is to take charge of what we can do now to move forward and find healing. Living in the future is hard to do. That statement is pretty self explanatory, but we still try to do it anyway. It is important to have dreams and goals and to make plans for that. But aside from that, we can't know what the future will bring. When we make our plans and work our plans, we are in the present taking care of our future. When we are not reacting from the place of our own opinions, but are reflective and in the moment, we are at our most focused, clear and confident. That is our inner power.
" If we react, we are in the past, if we respond, we are in the present"
Meditation is a natural way to get yourself experiencing the present moment. Meditation is a mental discipline by which we attempt to get beyond the reflexive thinking mind into a deeper state of relaxation and awareness. 1.It lowers oxygen consumption, decreases respiratory rate, increases blood flow, slows the heart rate and so increases heart stamina for exercising. 2. It is beneficial for people with high blood pressure and chronic diseases like arthritis and allergies. 3. It deepens the the level of relaxation thus helping people with anxiety disorders and tension headaches. 4. It has a profoundly positive effect on moods and behavior as it increases serotonin production. Low serotonin levels are associated with depression, obesity, insomnia as well as headaches. 5. It reduces the symptoms of pre-menstrual syndrome as well as the symptoms of menopause. 6. Since it helps to build up the immune system, it pretty much helps all of the diseases of mankind. You can't get it much better than that. Even ten minutes a day of deep breathing and clearing one's mind can have a good effect on your overall health. Try ten minutes at a time and work up to more as you become proficient at it. One thing you need to remember, when your mind brings unwanted thoughts as you are meditating, push the thoughts aside, know that it will be that way, and carry on without reproach. Living in the Moment, or Mindfulness is Our Best Option for Health. Living in the moment, or mindfulness, is a well-used but often misunderstood, phrase.In no way does it mean not caring. We can still care about where we have been, what we have done and make plans for our future. But we as humans spend a large portion of our time and energy regretting the past and worrying about the future. This causes great anxiety and stress and keeps us from being here with what is happening for us right here, and right now. There is no other time but now. As we are frantically recalling what we have done, what others have done and said to us, what has happened and wishing that things had been another way, we don’t see and hear the important people and things around us. There is no quality in life when we are not present in it. How do we slow down? This is a tall order in our ever changing and fast moving world. Let me explain how I see the concept of living in the moment. Small children are a prime example of how we naturally live in the present. 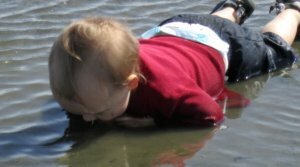 Yesterday we took our 21month old grandson to the beach. It was a new experience for him. Having never seen the ocean and the great expanse of sand, he was excited and fascinated by it. It was the beginning of summer and so still a little cool but he didn’t seem to notice. 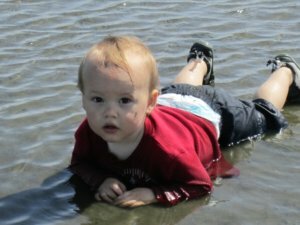 He immediately fell into the tidal pools, clothes and all, and squealed with delight. He ran and splashed and fell into it again and again. He laid there on his belly for a long time and put his face in the water over and over. He tasted the salt and wanted to taste it again. He laughed and kicked. He got up and fell down repeatedly and talked incessantly in his own little language. He got dirty. He ate the sand and wore the mud and life couldn’t be better for him. That is what I call ‘living in the moment’. Answering the question of why we don’t live in the moment is a challenge. There are so many reasons why we forget to sit and listen to each other, or walk past a rose garden without stopping to admire it. It is a fast-paced world that we live in and we are experiencing revolutionary changes in technology. Life was hectic enough in the early 1900s, but today people are racing around with high-tech gadgets and juggling many tasks. It used to be that a family could survive on one salary but more and more families have both parents working full time. Our lives sometimes feel as if they are whirling out of control. The stress becomes a large part of us and we loose the quality of life. Here are a few suggestions to slow our lives down and to experience the small but special things in life.•	Understand that the most important part of our lives is our relationships. When we are constantly worrying about the past or fretting about the future, the people we care about suffer.•	Be aware that we may be living a fast-paced life to the exclusion of our peace of mind. Make it a priority to find a way to slow down.•	When we realize that we are on the treadmill, let’s take a moment to breath deeply and become aware of the things around us. Let’s be grateful for all that we have. •	Why not create a schedule that includes time for our selves and time for our loved ones.•	Learning to meditate is a fantastic way to bring sanity back into our lives. Statistics prove that people who meditate are healthier physically and mentally.•	We can re-evaluate what our priorities are and make changes to accommodate them. Life is wonderful! It should be a joy and not a burden.